This book is a guide to aligning with your inner Sacred and to creating a life of joy that expresses your inner Truth. Specific guidelines are provided for manifesting with mantra prayer as well as a detailed guide for creating your spiritual practice. The book concludes with numerous stories, from participants in Rev. Rutt's classes over the years, sharing their experiences with mantra prayer. Access to mantra pronunciations is included with purchase. 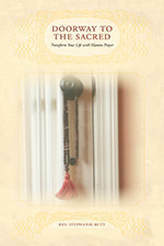 "Doorway to the Sacred: Transform Your Life with Mantra Prayer is a wonderful guide to personal growth and an inspirational guide to spiritual practices in six faith traditions. The first 60 pages give an orientation to spiritual practice and seven guidelines, containing an explanation of mantra prayer and how it works for both inner growth and assisting the reader in overcoming difficulties in life. This is a practical way to transform from where you are to inner freedom. Rev. Stephanie Rutt also gives a very practical guide to people who want to learn how to begin a mantra prayer practice in any tradition and also a guide as to how to avoid the inner resistance to change, which can block us from making the practice a daily one for life. She also gives inspiration and encouragement to seekers on their paths. The balance of this book teaches beautiful mantra prayers in each of the six traditions and provides testimonials of successes in using them. The excellent section on Sanskrit mantras has the Master Mantra (Gayatri), the Great Liberation Mantra (Taraka) and four more very powerful mantras with explanations and guidance for their use. This is a great book for guiding beginners, an inspirational book for more experienced practitioners, and an adventure in learning from the traditions unfamiliar to the reader." "Stephanie Rutt is one of America's finest teachers of East-West spirituality. In this book she weaves a beautiful and inspiring story of our belovedness in the Divine. Stephanie's practical insights and instructions will open up new pathways of prayer, especially for those who are drawn to the devotional common ground between Hinduism and Christianity. Doorway to the Sacred will become a classic text for seekers everywhere who seek attainment with the infinite music of the Creator."